Mljet is the first larger island one come upon while sailing the Croatian Adriatic from the direction from south to north. It is Croatia's greenest island with its Mediterranean vegetation, clear and clean sea, gentle sandy shoreline and a wealth of underwater sea life. The island is conisdered to be one of the most beautiful of the Croatian islands too. 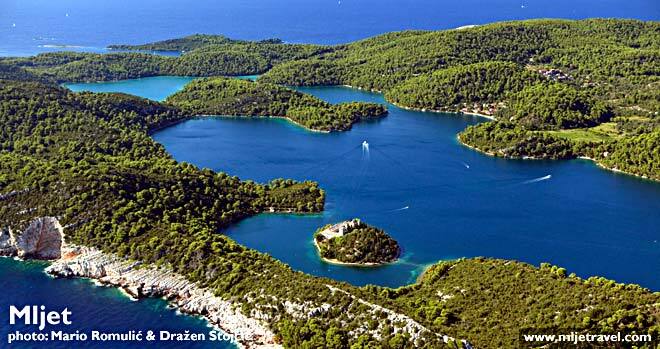 Mljet is well known for its white and red wine, olives and goat's cheese. It is indeed an unspoilt island covered by a dense Mediterranean forest. The sea around here is rich in fish and marine life. The island is also well known for its two salted lakes - Veliko and Malo Jezero that are located at the north end of the island. On the small St Mary's Island in the middle of Veliko Jezero lake, there is an old Benedictine monastery. Beside beach Saplunara (on the south of the island), Veliko and Malo Jezero are favorite swimming spots for locals and visitors alike. North- west part of the island of Mljet is also one of Croatian National Parks, and is therefore, one of the favorite destinations for travellers to this part of Croatia.